They do it in Bordeaux. They do it in Champagne. They do it in many of the world’s best wine regions to enhance longevity and endurance. So what are all these classic and sophisticated regions doing to enhance their wares? Blending of course! Another revered style of wine, in line with Bordeaux and Champagne, that owes its character to the art and science of blending, is Port. Port is a fortified wine named after Portugal’s second largest city of Porto, from where the wine has been shipped for over 300 years – but most of us know it as the bottle that comes out once a year at Christmas! During a recent visit to the beautiful city of Porto and the spectacular near-vertical vineyards of the Douro Valley, I kept noticing a common theme among the conversations we had with winemakers and producers everywhere we went – the importance of the blend. 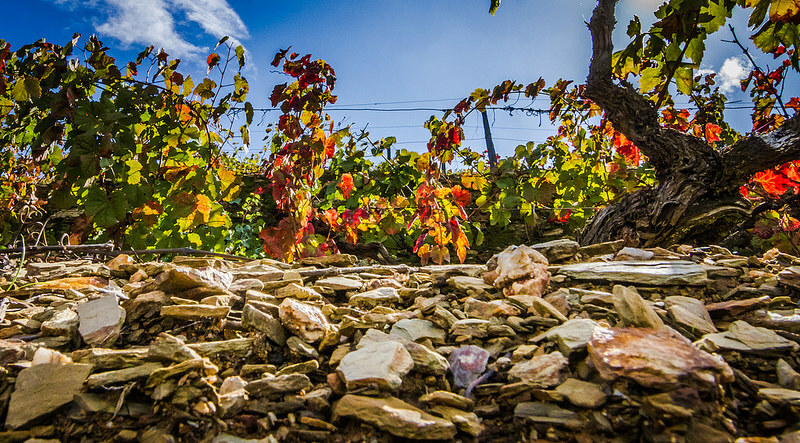 There are many blends used in making port – the most familiar being a blend of grape varieties, but there are also ones that combine the wines of different parts of the region, not to mention blends of various vintages. Let’s start with the blending of grape varieties. The grapes that make port come from the Douro Valley, approximately 70km upstream along the river of the same name. 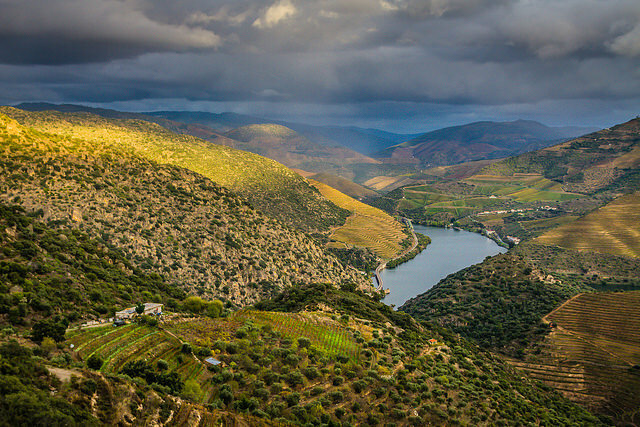 There are three sub-regions of the Douro Valley – the Baixo Corgo, Cima Corgo and Douro Superior – all of which get different exposure to the sun, varying amounts of rainfall and therefore produce grapes of assorted quality. When blended, the wines from these three areas benefit from and contribute to each other in a way that generates a more powerful, well-rounded wine. During our visit I found it fascinating to see how intricately the winemakers know every inch of their land and understand where the strengths and weaknesses can be best utilized in the different styles of wine they make. The downside of a field blend, as we discovered while attempting to harvest grapes, is that not all varieties are created equal – some ripen faster than others and we noticed a few bunches that had beautifully big ripe grapes, growing next to some that seemed to need more time on the vine. To combat this, many new vineyards are planted with a single variety to ensure the ideal level of ripeness on harvest day. 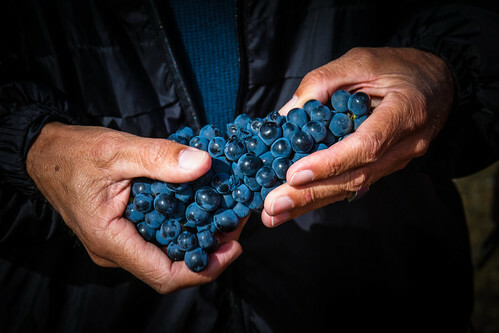 Even when grown in separate vineyards, the grapes will be blended with other varieties to make the final product. This is because each one adds something specific to the blend. In the 70’s a study was carried out which found there are 5 native grape varieties that are especially suited to the traits desired for making port. These are Touriga Nacional, Touriga Franca, Tinta Roriz (Tempranillo in Spain), Tinto Cão and Tinta Barroca. During our trip, we were able to experience for ourselves exactly how each variety differs, which in turn made it obvious to understand why it’s so necessary to combine them. This happened during a visit with the young, enthusiastic, knowledgeable, Oscar Quevedo. Oscar is not a winemaker (that’s his sister’s role), but he rolls up his sleeves and jumps with both feet into all aspects of the business (his main focus is marketing). There aren’t any questions (even the tough ones!) he doesn’t have in-depth answers to. We were in the Quevedo cellar bouncing between barrels, tasting vintage after vintage of his port, when he suddenly became even more animated than always (passion veritably oozes from his pores!). He was using his wine thief to pull a taste from one of 5 barrels that were in a special section by themselves, away from all the other rows, which piqued our curiosity. Oscar explained that this is a fun little experiment he’s doing and was excited to show us. Each barrel contained port made from a single variety. The first was Tinta Cão. This is a late-ripening variety with small berries and tasted like a good wine, even though it was fortified. Next was Touriga Franca. I quite liked this one for the stewed figs and plum flavours which are the qualities this variety usually adds to the blend. Third was Touriga Nacional with its big, hearty structure and creamy chocolate characters and massive, grippy tannins. Number 4 was Sausão which, as Oscar explained is mainly used for it’s dark, penetrating colour. All it takes to deepen the colour of a blend is the addition of only about 1 – 1.5% of Sausão. Finally we tasted the Tinta Roriz. This one had much less tannin and much more fruit than the others, but on its own, wasn’t very interesting. Oscar explained that a key element achieved through blending different grape varieties is complexity. A single varietal on its own may have great colour and fruit but lack length and depth of flavour, and while it may be deemed a good enough, drinkable wine in its own right, the addition of another wine or two, in just the right quantity, may move it up the scale from good to great. Oscar’s experiment was the perfect example of why blending is so essential in creating a wine that has all the necessary components to make it something truly exceptional. I’m sure if we’d had more time, Oscar would have had us all creating our own blends from these five barrels, then we would have seen just how hard it is to find the right levels of each one. There’s always next time! 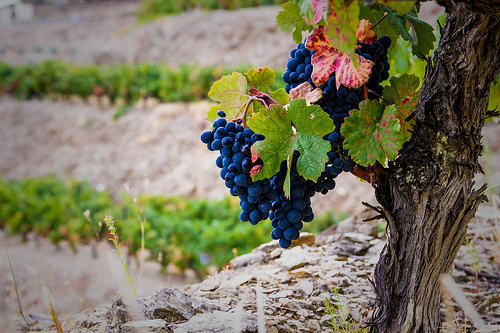 For many of the big producers, this has proven to be quite a conundrum as they’ve been blending wines for centuries to make port, but now many Douro producers are producing dry table wines, often from a single vineyard, and are having to discover the age-worthiness of these single vineyard wines. However, Churchill’s doesn’t just produce port, they also make beautiful dry wines (which we sipped during lunch and I thought were excellent). One of these is the Quinta da Gricha, a field blend of different grape varieties, yes, but from different vineyards? No. The grapes are grown in the one single vineyard surrounding the building in which we ate. But will it have the ageing capacity of the blends? Ah, there’s the rub. Referring to the fact that port makers, who are so used to working on their painstaking port blends, are now making unblended, single vineyard dry wines and have yet to really see how consistently they age, Johnny admitted, “It creates an interesting conflict for port shippers”. The combination of different vintages was the third type of blending we experienced while in the Douro. As wine drinkers, we are used to seeing one vintage on the label of the wines we enjoy and the most common place we’ll find the words ‘non-vintage’ or NV, is on a bottle of Champagne. Many ports are also non-vintage, but the term won’t be listed on the label. An aged tawny port for example may say 10yr- or 20yr-old on the label, but this is actually an approximation of age since they are made with wines from many vintages, including some a lot older than the age indicates. Blending of vintages is another tool a port maker can use to create a wine that is ‘just right’. Whether it’s grape varieties, vineyard plots or vintages, blending the final product is nothing less than an art. It takes a deep, almost innate sense of the desired outcome to know which grapes provide the delicate aroma, powerful colour and requisite structure, not to mention understanding how a wine that’s been ageing for nearly a decade will benefit from a touch of one two vintages older. It is this precision, this instinctive talent that makes blurs the line between winemaker and virtuoso. Given all the possible variables amongst numerous components of a blend, it is a skilled craftsman who can detect the so-subtle nuances between different wines and understand how to use just the right amount of each one to bring together a wine that is greater than the sum of its parts. And for some of the greatest, you need look no further than the Port section of your favourite wine shop.